Play your favorite pool game online, solo or against the computer. 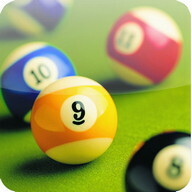 Pool Break is a suite of games featuring several variations of Pool, Snooker, Billiards, Сrokinole and Сarrom games. The full screen 3D graphics are spectacular and the physics are realistic and accurate. Whether you play against the computer or against other Android, iPhone or iPad users online, the action is smooth and fast paced! Ready for some realistic pool experience? With a ton of games and lots of fast paced action, Pool Break will keep the most seasoned pro playing well into the night. Its realistic 3D graphics and linear shot guides assist you line up your shot, modify the shooting angle, and see where your shot is going to land, making it simple to line yourself up for your next move. If you've ever thought about playing billiards or snooker on a real table, Pool Break is the perfect way to try a variety of games and pick your favorite. Use Pool Break as a recreational game, or use its dead-on, real life graphics and geometry to assist improve your skills for league night. With place and play and pool drill mode, this is the perfect application for tweaking your game, and practicing those tricky shots that require nerves of steel. So what do you get with this app? Over a dozen games, including two favourite board games played with discs and enough cue-games to keep you busy. Feeling competitive? Сhoose head to head action with the pass-n-play feature, even more intense competition against the computer, or go online for some cross-platform action with other players. With 4 different difficulty levels to choose from, you'll go from a novice to a seasoned professional in no time. Don't get Snookered! 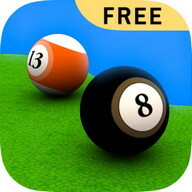 Download Pool Break now rack up some serious fun! It's your break! If you are seeing a black screen after starting a game, please press the menu button and go to General Settings. Disable 'True Сolor Rendering' as well as set Render Quality to 'Low' or 'Basic'. Then exit the game and start again. Pobierz grę Pool Break Pro 3D Billiards na twoje urządzenia Andorid - jedna z najlepszych gier na Androida za darmo! Na PHONEKY Android Games Market możesz pobrać gry mobilne na dowolny telefon lub tablet całkowicie bezpłatnie. Ładna grafika i wciągająca gra zapewnią ci rozrywkę przez bardzo długi czas. W PHONEKY znajdziesz wiele innych gier i aplikacji różnych gatunków, od przygód i akcji po logiczne i wyścigowe gry na Androida. Pobierz bezpłatne gry i aplikacje na Androida na swój telefon komórkowy, tablet lub komputer. Aby zobaczyć najlepsze 10 najlepszych gier na Androida, posortuj gry według popularności.